Midfielder Davy Propper says Brighton can take confidence from their performance against Chelsea on Saturday as they head into a crucial period of the season. Despite the 4-0 scoreline, Albion played well for large periods of the game in a new 3-5-2 formation and were unlucky not to get the score back to 2-1 on several occasions. After Saturday's trip to Middlesbrough in the FA Cup, the Seagulls face Southampton, West Ham, Stoke and Swansea in what could prove to be a season-defining period. Propper said: "It's the period for us where we need to get some points. With how we played in this game we have to get some confidence from it. "It was very difficult as after five minutes it was 2-0 but then we got a little bit in the game and had some chances. Maybe the moments in the penalty box we could have got a penalty and back in the game. "I think we played well but at the end we gave them a little bit of space and they are good at those things. "We go on and we have to play like this more." 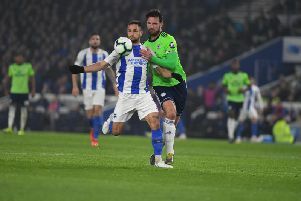 Propper almost scored his first Brighton goal when his diving header came back off a post early in the second half and said: "It was a little bit unlucky, it was a good header and a good cross and was unlucky it didn't go in."